Surprisingly, even a well-kept home can attract rats. Like most rodents, rats are agile creates who can squeeze into holes as small as half an inch in length. If you aren’t trained to look for entry points such as this, it’s hard to keep rats out of your home or business when it offers an abundance of shelter, food, and water. If you notice rat droppings around your home or hear scurrying in your attic, contact the local professionals at Critter Control which boasts more than 30 years of rat removal experience. We train our specialist to not only safely and efficiently remove the unwanted critters, but to identify and repair entry points and animal damage to your home to prevent another invasion. Contact us today to schedule your free inspection and begin the process to a rat-free home. 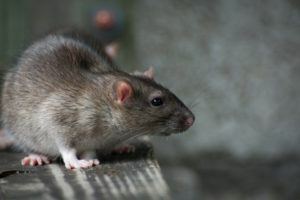 Rats frequently carry diseases in their fur and droppings, which can cause potentially deadly diseases in humans such as rat-bite fever and leptospirosis. Families with children and pets also face an additional threat as rats have a tendency to bite and scratch when provoked. Children and animals don’t often recognize the threat until it’s too late.